Okay, so here it is! Your chance to win Windows 7 License keys, without doing much. Since Windows 7 has been Released to Manufacturing now, WinMatrix has decided to give away three genuine Windows 7 License keys to the winners of this contest. Please keep in mind, only keys would be given, not the installation media or the ISO file. License keys would be given courtesy of Abhi and lareeth. 1st prize: Windows 7 Ultimate 32-bit or 64-bit key. 2nd prize: Windows 7 Professional 32-bit or 64-bit key. 3rd prize: Windows 7 Home Premium 32-bit or 64-bit key. Please go through the Rules and Conditions carefully before posting, as you can only post your entry once. Members with 10 or more posts can participate. You need to join the WinMatrix Facebook page and mention the link to the entry that you post here on the Facebook page. After you submit the entry here, click on the post # at the top of your post on the right hand side, this will give you the link to that post. You need to mention this link on the WinMatrix Facebook page (on the Wall), or your entry will not be considered. This is being done to avoid spammers/troll here, and to ensure that you're active at both the places. Contest starts: from the moment the first person replies to this topic. Contest ends: Saturday, August 15, 2009 at 12:00:00 UTC/GMT. Entries submitted after that would not be considered. The participants need to write a post about their Favorite Feature or thing in Windows 7 in not more than 500 words. You can include screenshots if you wish, but don't post large images. Quality of the post, which would be indicative of the Reputation Points the post gets, from other members. Judging would be done at the close of the contest, by Jatin, Abhi and lareeth and in case of any tie (members getting same reputation points for posts), their decision would be final. The winners would be announced here at WinMatrix and also at Facebook after that, and would be notified of their prizes through Personal Messages as well. Winners need to specify which key they want, that is, either 32-bit or 64-bit. Only one would be given. Please avoid making unnecessary comments at other's posts, and if you're not interested in participating, please do not post. In case of any confusion or problem, please PM either Jatin, Abhi or lareeth. So Ladies and Gentlemen, lets kick of this one of a kind contest. Please play fair. Thanks everyone for your participation. The Contest is CLOSED now, and we're not accepting any more entries, only the entries submitted till August 15, 2009, 12:00:00 UTC/GMT would be considered and evaluated. Also, please do not edit your posts now, or they won't be considered. The Winners will be announced here soon. Edited by Abhi, 15 August 2009 - 03:39 PM. My favourite thing about Windows 7 would probably not just be the taskbar, but the whole damn OS! For me its just soo simple, and speedy! The taskbar is really cool, the way that all your running processes of that app are grouped into one little button, it makes it so much easier to find that running app your looking for! Also the wallpapers, they are just so beautiful, and in some cases, damn WEIRD! But the drugged up makers of those wallpapers are GENIUS! They are just so cool, and I'm even using one of the wallpapers now! To me everything runs so much quicker and better, and its just so easy to get what you want done, quickly and easily. All the apps I used in XP and Vista work in this, and even if they don't, the compatibility options like the wizard and Windows XP mode make them run! Overall, the OS is: Simple, speedy, easy, beautiful. Those 4 words sum up Windows 7 beautifully. Edited by MistaBishi, 10 August 2009 - 03:45 AM. My favorite feature about Microsoft’s Windows 7 is the updated taskbar, appropriately dubbed the “Superbar”. This new taskbar is better than what was included in previous versions of Windows in many ways such as aesthetically, functionally, and just plain ease of use. Three of these things, with great synergy, provide users with an extraordinary experience. 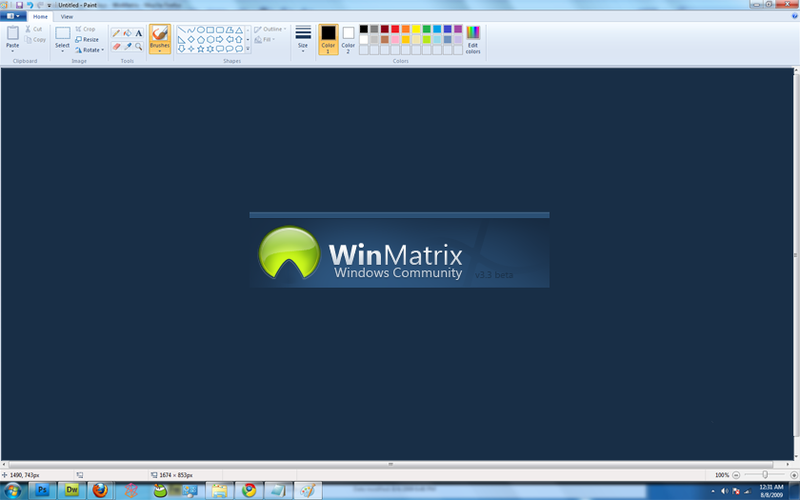 The taskbar has received a facelift in the past few versions of Windows, such as the colorful change XP brought, the overhaul in Vista, and now the Superbar. This new taskbar has obtained a few extra pixels in height, thus giving the default icon size a boost, and lost all color to follow the Aero Glass theme. This size enhancement offers better control for touch screens, and makes it easier to quickly open applications which users have pinned to the taskbar. This is also a revision to the Quick Launch feature (which has been disposed of), allowing users to simply pin applications to the Superbar. Without the icon text as in previous versions of Windows, the thumbnail preview feature has also been augmented in multiple ways. Introduced in Vista, thumbnail previews now function to allow users to close open windows by simply clicking the ‘X’ button in the preview. The use of thumbnail previews doesn’t stop there though, as thumbnail previews have now been put into overdrive. All other windows will become transparent to allow the user to clearly see whatever application window he or she may be trying to view, steering clear of the hassle of minimizing windows to get a full look at a program. This applies similarly for the desktop with the new Aero Peek feature, a substitute for the ‘Show Desktop’ option. All windows will become transparent giving one a full preview of the desktop. Located at the very right of the Superbar, things can’t get much easier than this. And finally, just how does Windows 7 make life easier on the user? As you can see above, the whole concept of the Superbar is what makes it remarkable. The tiny increase in size has no major effect on windows, but on the taskbar it does wonders. Pinning and launching icons to and from the taskbar, as well as being able to open and close windows by just hovering over them; all from one place. Flick your mouse to the bottom-right, click, and voila, you can see your desktop, how neat is that? Or how about the new Jump List feature? 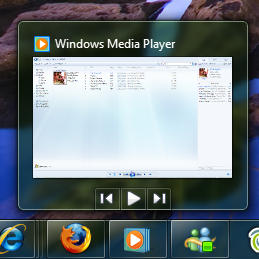 A Windows Media Player jump list shows your last played tracks, or an Internet Explorer one that shows a list of recently visited websites. There’s not much else to say about the Superbar, the features it offers uplift the atmosphere of the operating system. The aesthetics, functions, and simplicity of the taskbar really let users feel that it’s all at their fingertips. Three years in the making, albeit, the ‘Wow’ starts now. Thanks for reading, and good luck to all participants. Edited by Merforga, 08 August 2009 - 12:22 AM. offtopic: Thread pinned and topic title edited a little for more views Now where did the sharing button go after the upgrade ?? edit: added the digg link in the post. offtopic: Thread pinned and topic title edited a little for more views Now where did the sharing button go ?? My favorite thing about windows 7 is aero peek, and slideshow backgrounds. I'm always changing my background based on my mood, so now I can have windows do it for me. It doesnt stop at there, it lets my check off in a list the backgrounds I dont want to shuffle in. I can set 24 backgrounds and have it change every hour so at night time I have dark backgrounds and at day it's light backgrounds. I love it! Another great thing is the awesome taskbar effects, the grouping makes it easy to keep the taskbar clean when cluttered and looks really clean and elegant like the Aero Effects MS has imfamously been known for together it just makes Windows 7 a great OS for XP upgraders, the biggest inside tweak had to be the better Dual Core support for my lower end laptop and the DX11 support which is great because Im building a gaming rig, all together that is a huge leap from XP and ends up dropping jaws. Microsoft also talks about better thread management and intense kernal improvements. The improvments are so big that windows 7 can support upto 256 simutanious processors. Windows 7 is practically future proof. One big fear I have with fresh installs of windows is the inevitable Windows slowdown. In windows 7 I've insalled alot of beta programs and the great software from our local developers, because it is a temporary OS I didnt care how trashed this install got. However I haven't seen much of a slowdown on Windows 7, this is completely unlike my other experiences with windows XP. I think they bumped a little more life on the OS, slow down is unnoticable on my 4-5 year old XP notebook. Edited by PurplePeopleEater, 09 August 2009 - 07:36 PM. Crap! I don't have a Facebook account, my parents won't let me. I already reserved my Home Premium copy though, so I'm good. Best of luck to all participants, and may the judges be fair and not biased in decision. Does it necessarily have to be a FaceBook account? Some people don't/can't sign up. My favorite feature in Windows 7 is the operating system's nativity. If someone has never used Windows before, they can hop on and start surfing the internet almost immediately. The taskbar is designed in a way that it is eye-catching so you want to click on the orb, thus revealing the installed programs such as Internet Explorer which allows you to browse the web. With features such as thumbnails and collapsed icons, the taskbar allows both beginner and advanced users to efficiently work by keeping same types of programs grouped. Also, being able to preview open windows without actually having to restore and shuffle through them is extremely helpful. In all, the overall usability of the system allows anyone to easily run common programs and customize Windows to their own personality: essentially "Windows without walls." Edited by xEks, 08 August 2009 - 01:41 AM. I love the new Aero Snap feature. I always wanted to switch to dual monitor because I hated all the open windows between each other. And going to the taskbar and clicking to show windows side by side is just to much work. Now I don't need to buy another monitor. I can just drag my windows where I want them to be en do 2 jobs at the same time . My favorite feature in Windows 7 is the Greatly Improved Performance. Ever since Windows XP, I've been longing for a performance that doesn't deteriorate overtime and I have to say, Windows 7 didn't disappoint me with its RC. Whatever software I installed, the boot time remained quick and the OS become responsive as soon as the desktop was visible. Same for the Shutdown/Logoff times, never did Windows waste my time "Saving Settings" for too long. The opening, closing of applications and navigation between them is also hugely improved giving the feel of a robust and responsive OS, even faster than Windows XP in some cases. Also, it requires less steps to do common tasks...which would involve a bit of digging in Windows XP. Another matter of improved performance was the Sleep mode. I would've never dreamed of a Standby/Hibernate hybrid mode but that's exactly what it is, I don't have to care for a power outage while leaving the system in an S3 standby mode (Sleep Mode) and the best part is...the system switches to this mode extremely fast. Even the benchmarks show that Windows 7 is faster and more responsive than Windows Vista. I can safely say that it utilizes multiple cores very efficiently and even the 64-bit version is very much usable now (compatibility and performance wise), allowing the users to think about permanently switching from 32-bit, since 64-bit computing is inevitably going to be the main focus in the future, it's great that users are able to access it at this early stage...which will benefit development for it in the long run. This is by far, the best Windows version ever and I can only hope that the next version will be even better. Edited by Afzal, 11 August 2009 - 12:48 PM. My favorite feature of Windows 7 is the new taskbar. The taskbar has been in all of the Windows operating systems I have operated. It is what I use to identify Windows to this day. The last thing I expected them to change was the taskbar, so I was a little surprised when I looked at some screenshots of it, but I was not skeptical. The taskbar was meant for multi-tasking. Over the years I have operated a Windows machine, I have noticed that multi-tasking can be pretty hard with the way the taskbar handled multiple Windows. The different tasks would grow and it would make it harder & harder to tell which window is which. This was addressed in Windows XP. It was still harder to tell which was which, so Windows Vista came up with Live Previews. This was awesome, and could almost not be topped, until 7 came along. Windows 7 has, if not almost, perfected the taskbar. The new taskbar, or “Superbar”, is meant to compete with the dock Apple has implemented with their OS. Just by looking, I could tell that it won. The superbar implements a new tile system, instead of long and space wasting bars. These new tiles just display a large icon representing a program, no words, no long bars, & no waste of space. This new system encourages multi-tasking, just because you can have your most important programs on the taskbar, and need no more space. The tile system & superbar is a very small part in comparison of the new OS, but it is a very crucial & functional feature in making the Windows OS better than the rest. 64-bit, if you do not mind. Edited by dtack68, 11 August 2009 - 12:29 AM. Being an Electrical and Computer Engineering student, I really look into details. Learning from Windows Vista, Microsoft was able to build on the great UI (User Interface) in Windows 7 while addressing the performance glitches Windows Vista suffered from. One of the improvements that I really valued is the performance gain with multiple GDI (Graphics Device Interface) applications running simultaneously on mutli-core processors. In Windows Vista, the most frequent cause of hang-ups was when two applications were trying to access the graphics card at the same time. The GDI design in Windows Vista allowed a single application to hold a system-wide global lock. As a result, other applications trying to access the graphics card at the same time would get locked out and eventually the hang-ups would occur. In order to solve the problem, the Windows 7 team re-architectured the internal synchronization mechanism and therefore reduced the lock contention and the memory footprint. Thus, a GDI application window visible on the desktop in Windows 7 consumes half the memory when compared to Windows Vista. Moreover, these improvements also resulted in a better rendering performance of GDI applications on multi-core processors. The overall result was a more responsive experience. I think this is Windows 7’s best feature because what is the rest of all the features good for if a smooth and snappy navigation is absent? The sum of frame rate (FPS) as a function of the number of applications. Edited by xsever, 10 August 2009 - 01:46 AM. My favorite feature in Windows 7 is the new taskbar, AKA, the “superbar”. This new feature to Windows 7 greatly enhances the taskbar from previous Windows versions, and allows users to have more control over the way their desktop looks and behaves. For me, this new taskbar layout allows me to save precious real estate on my netbook’s small screen by hiding window labels and consolidating all open windows of the same type into one button on the taskbar, while on my desktop PC, I am able to set up the taskbar to act in the same manner the taskbar did in Windows 95 on up through Windows Vista. Another huge improvement to the taskbar is the ability pin your favorite programs to the bar itself, similar to the Quick Launch Toolbar we all grew to love in previous versions of Windows, allowing users to quickly find the programs they need to run without the hassle of digging through the Start Menu or minimizing to the desktop. The difference between the two is now you have the ability to use beautifully rendered high resolution icons, perfect for those with higher resolution displays. Or, if you are like me, and want to save space on your netbook’s screen, you can always switch back to the smaller icons if you choose to do so. Also expanded upon is the ability to preview any open windows you may have, by hovering over these icons. However, unlike the preview windows in Windows Vista, you may interact with these, and if you hover your mouse over the preview image, the window will appear on your screen as it would if it were open. This makes it easier for anyone running more than one instance of the same program, for example, Word, Excel, and Internet Explorer, to differentiate between multiple documents. Finally, the superbar also allows the user to re-arrange the items pinned to the taskbar in any order they desire. This includes open windows as well; a feature many feel has been missing from Windows for quite some time. The new taskbar layout greatly improves upon the old incarnations seen in older versions of Windows, and greatly maximizes productivity by allowing the user to customize the layout to fit their needs. I know many people will feel out of place trying to learn a new UI, however once they have opened up to it, they will find that it is superior in every way to the old taskbar. Best of luck to everyone participating! Edited by Frylock86, 08 August 2009 - 03:44 AM. meh. what's all the fuss about free and legal anyway. It's impossible to be detected of piracy in our country. Hundreds of pirated DVD sellers are scattered all over the street. the Optical Media Board aka anti-Pirate guys in our country can't annihilate our pirated country. Plus, most of what they are bothering are movies. millions of pesos are lost in our country because of piraters. Our situation can't be helped. most of the computers we have here have Limewire. everyone has a collection of pirated DVDs. All binary stuff you ever know is piratable. Movies, Softwares, Interactive Disney things, music, all of them. And the police ain't even care to the dvd stands, probably they even bought there. This contest is somehow pointless since I can get away with my pirating so easily. Really sad truth, but a really nice anyway. License meh. My favorite thing is windows 7 would have to be...(After making up my mind) The new and improved MS Paint. I don't know why but I love it. You can do so much more in a faster time period. the "ribbon ui" is just great. My second favorite Feature would have to be..... The "SUPERBAR". It great, I have all of my needs "pined" to it i got PhotoShop, Dreamweaver, Flash, fireworks and last but not least FireFox with my home page being http://Winmatrix.com. And the live preview are sweet. Edited by knowledgeorb, 08 August 2009 - 10:23 PM. The subject of Windows 7 is a controversial issue. At one stage or another, every man woman or child will be faced with the issue of Windows 7. Cited by many as the single most important influence on post modern micro eco compartmentalism, it is impossible to overestimate its impact on modern thought. Inevitably feelings run deep amongst socialists, who are likely to form a major stronghold in the inevitable battle for hearts and minds. Here begins my indepth analysis of the glourious subject of Windows 7. Society is our own everyday reality. When Lance Bandaner said 'twelve times I've traversed the ocean of youthful ambition but society still collects my foot prints'  he created a monster which society has been attempting to tame ever since. A child’s approach to Windows 7 is crunchy on the outside but soft in the middle. Did I mention how lovely Windows 7 is? It has been said that the one thing in society which could survive a nuclear attack is Windows 7. This is incorrect, actually cockroaches are the only thing which can survive a nuclear attack. There has been a great deal of discussion in the world of economics, centred on the value of Windows 7. We will primarily be focusing on the JTB-Guide-Dog model, a classic economic system of analysis. There are a number of reasons which may be attributed to this unquestionable correlation. Obviously transport costs will eventually break free from the powerful influence of Windows 7, but not before we see a standardised commercial policy for all. The economic policy spectrum is seeing a period of unprecedented growth. Machiavellian politics is rife. Are our leaders justified in pursuing and maintaining political power? Comparing the general view of politics held by the poor of the west with those of the east can be like comparing Windows 7 and ones own image of themselves. One quote comes instantly to mind when examining this topic. I mean of course the words of award winning journalist Odysseus Woodpecker 'People in glass houses shouldn't through parties.' I argue that his insight into Windows 7 provided the inspiration for these great words. If Windows 7 be the food of politics, play on. Why did Windows 7 cross the road? - To get to the other side! Just my little joke, but lets hope that Windows 7 doesn't inspire similar hilarity in the next elections. We can say with certainty Windows 7 has, and will continue to be a major building block for the world in which we live. It collaborates successfully, influences the influencers, and is always fashionably late.